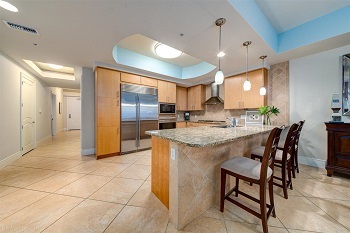 Orange Beach Alabama beach-front condominium home for sale at Turquoise Place. 3BR/3.5BA, 24th floor Unit w/ spacious living area & fireplace, wet bar and large kitchen w/ stainless high end-appliances. Relax on the gulf-front balcony while grilling on your gas grill or wind down in the Jacuzzi hot tub while watching the waves. In a complex of beautiful units this one stands apart! Panoramic view of sunrises and that sunset glow and the Pass. From this balcony you can access the beautifully decorated master bedroom perfect to rest after enjoying all the area has to offer. The master bath is also large with separate shower and Jacuzzi brand tub. There is so much to enjoy whether as an Owner or a Guest...a luxury condo, Gulf-front pool under the palms, lazy river pool, tennis courts, fitness center and sleek lobby all in Orange Beach, Alabama, where you can enjoy walking the white sand beaches, water sports, fishing in-shore and deep sea fishing. Units at Turquoise Place such as this have grossed over $100,000 per year in income. Don't miss seeing this one!